I had the privilege this week to co-facilitate an Adaptive Space workshop with Prof Mary Uhl-Bien at a local business school. I’ve long been intrigued by her work, so it was really good to see it applied practically. As always, I’m left with a need to make sense of where it fits into other complexity work I do. So this post is me thinking out loud. Mary’s work combines ideas from complexity and leadership. More recently her focus has been on understanding the adaptive process that describes how organisations function as complex adaptive systems. 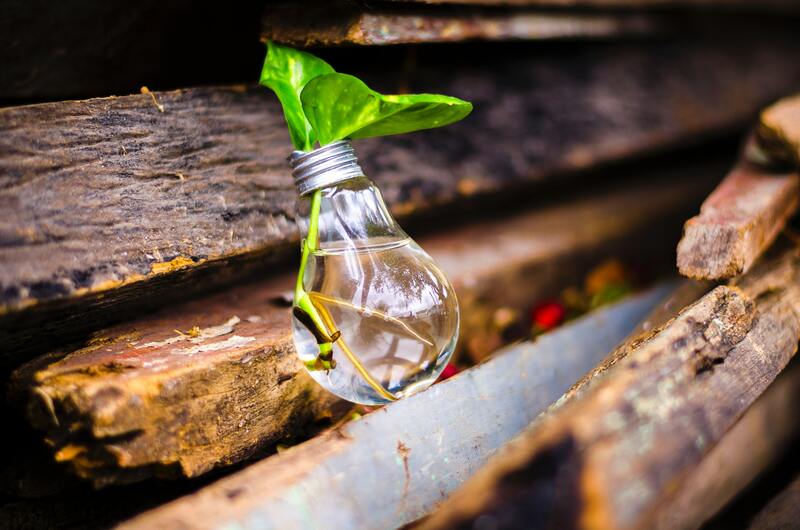 In order to thrive in complex and uncertain contexts organisations need to become more adaptive, however most describe this as a need for innovation. Mary’s research shows that a focus on increasing innovation may be counter productive, reason being that not all individuals are (or have to be) innovative. However in order to be future fit, all individuals have to be able to adapt (and most people already are). 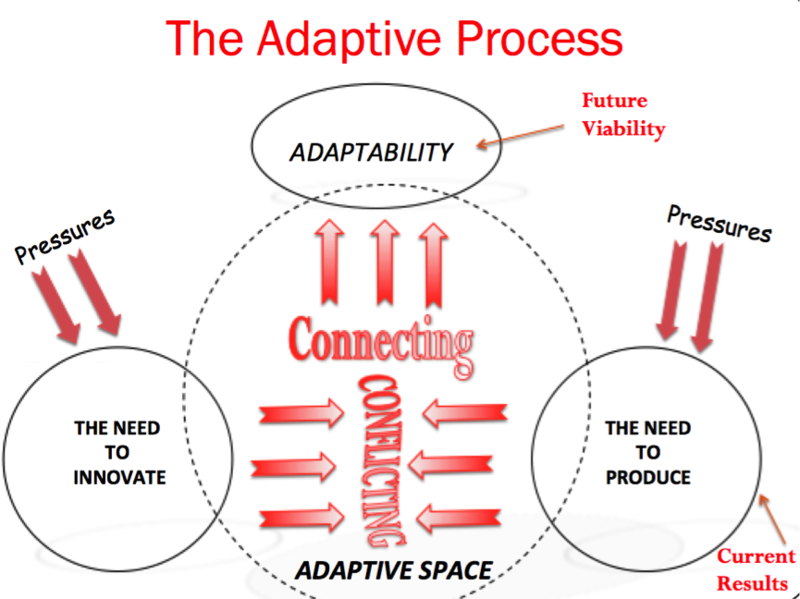 Increased adaptive capacity in the workforce plus the ability to enable adaptive space create the conditions for increased innovation to emerge at the organisational level. Mary’s theory describes this same tension. It is a fractal dynamic that can exist in our own minds when confronted with a choice between novelty and our habits; in teams; in organisations and in society. In organisations it is expressed as a tension between exploration (the need to innovate in what she calls the entrepreneurial system) and exploitation (the need to produce in the operational system). Often this dynamic is undermined when leaders under pressure do what they were taught to do: bring stability and mitigate conflict through ordered responses that destroy this tension. Such ordered responses lead to a suppression of the entrepreneurial system and eventually to organisations that are unable to adapt or innovate. In the longer term, such a bias towards stability and maximising current results compromises the organisations future viability. Pressure and crisis tend to open up adaptive space naturally – I often hear stories of how cross-silo collaboration happens spontaneously when a crisis occurs. The problem is our natural tendency to impose order when under pressure. 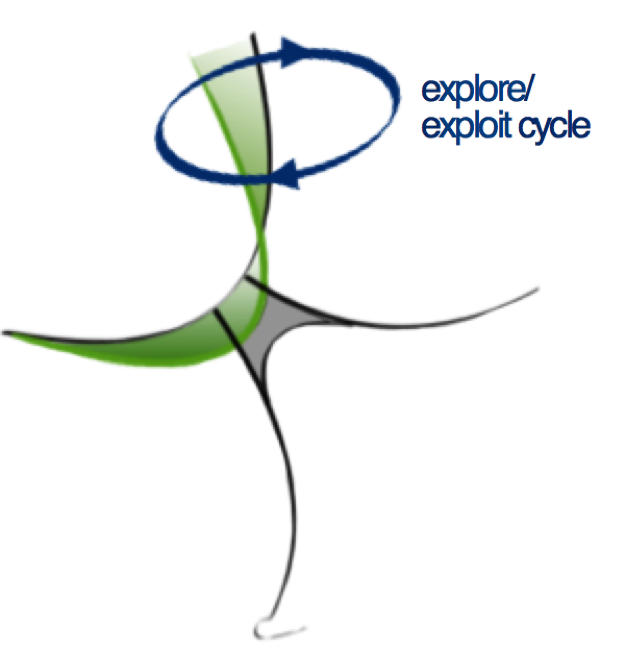 Organisations that have healthy adaptive processes respond from a complex paradigm and enable adaptive space where the tension between exploration and exploitation is productive even in the midst of external and internal pressures. Adaptive space can be created in workshop contexts through complex facilitation techniques than enable heterogeneous groups to engage tension creatively through conflicting (diverging) and connecting (converging) processes. 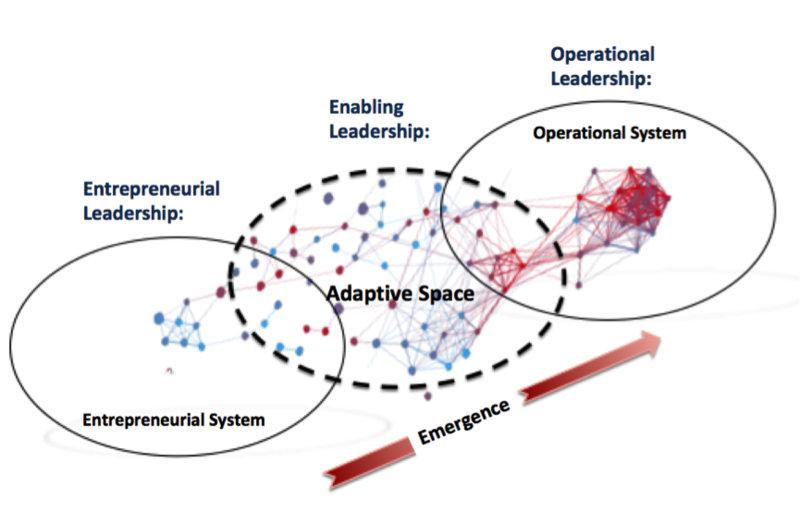 On an organisational level, adaptive space depends on networks and diffferent kinds of leadership: Enabling Leadership that create spaces where conflicting (engaging the tensions) and connecting (emerging new adaptive outcomes from those tensions) can take place. Problem is that many leaders who do this naturally are not seen or recognised by the system. Rob Cross used to refer to these kind of people are boundary spanners in the social network. They are able to foster connections across organisational boundaries, but often because of this they don’t “fit the profile” of leader that typically gets rewarded for results. Organisations seeking to become more adaptive and responsive need to think carefully about the kind of leadership behaviour that gets rewarded. Future viability does not depend on leaders who only focus on today’s results. They need entrepreneurial leaders able to explore and experiment; enabling leaders who are able to create adaptive space and the networks required to support it; and operational leaders who are adaptive enough to ensure that the operational system is able to remain flexible. I am still reflecting on all of this and how I might apply the thinking. I do find it interesting as a lens for typical Agile processes like Scrum. Scrum with it’s linear iterations and continuous learning dynamic can be seen a transitionary method across the liminal space between complex and complicated systems. I wonder if the more successful Agile transformations have Scrum Masters and Product Owners with a natural ability to enable adaptive space i.e. they enable effective flow between the self-organising Agile teams and the formal hierarchy? There are definite synergies here to the work of Harold Jarche and Glenda Eoyang as well, especially when it comes to practically applying the work and enabling leaders to engage these tensions, emerge connections and and create the networks required. Great blog. The work of Uhl-Bien, Arena and others in this area is brilliant and there much that organisaitons can learn. But it’s difficult to apply in practice I think, hence the need for reflection. You might be interested in this blog I wrote (https://www.linkedin.com/pulse/emergence-its-role-scaling-organisational-agility-john-turley/), which isn’t to the same standard as your I am afraid but does reflect the things I have been doing to ‘enable and adaptive space’ before I new what an adaptive space was or anything about complexity, systems thinking and all the rest. I look forward to reading about what conclusions you come to after your reflection. Hi John, I enjoyed your post. I think such an emergent route to agility is much more sustainable than the typical outside-in approach. Sounds like you played the role of connector and enabler in this process. A big problem with siloed organisations is exactly what you described as the two PM’s facing similar issues and not being able to connect the dots. Mary is focusing more on the practical application of her theory now, so we will hopefully see more cases/practitioner papers published in the not so distant future. Synergies with Mapping as well where people deploy according to aptitude (as now) but also attitude (pioneers – settlers – town planners). One of the weaknesses of that model in practice is the linkages between them, with a ‘mechanism for internal theft’ needed to pull through what’s being done (as you don’t want to complete people to hand things over – nothing more likely to alienate a pioneer than having to hand over his/her baby to someone else against their will). The boundary spanners could be that (semi?) permanent part of the structure while people shift between adjacent areas as, for example, pioneers follow a pet project into the adjacent settlers stage and use Cynefin to understand the type of approach needed now (eg moving from exploration to exploitation) so they adapt to the prevailing context.